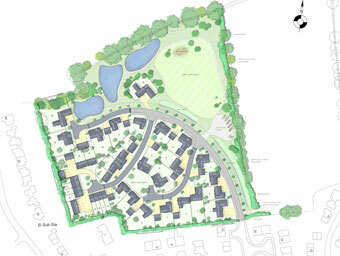 King’s Sutton has already done its bit to meet district housing requirements – The Parish Council was recently forced under South Northamptonshire Council’s Interim Rural Housing Planning Policy to agree to 40 new houses located outside the village confines. Many residents therefore take the view that King’s Sutton has already “taken its hit” under that policy. Likely to make existing problems worse – An additional 35 dwellings in King’s Sutton would further exacerbate existing issues of traffic congestion and under-capacity at the local primary school, with little likelihood of their stimulating additional economic activity within the village. Inadequate flood alleviation planning – Barwood Homes’ proposal for flood protection relies on “works by others” that may not be available to the company and for which there may be no third party funding. The company’s proposed Sustainable Urban Drainage System and retention pond also lack crucial details regarding future ownership and maintenance, and might in any case pose a risk to children using the planned open space. Inadequate sewerage planning – While Barwood Homes acknowledges that it would have to upgrade the sewer line in Hampton Drive and Sandringham Road, it makes no comment at all on its proposed development’s likely impact on Thames Water’s pumping station, which is already unfit for purpose. Scheme shown on drawings unlikely to be built – The parish council has seen no evidence that Barwood Homes has ever built anything at all. The company’s history suggests that it is more likely to sell-on any planning permission it wins to a mass-market housebuilder that would then be free to ignore all the cosmetically appealing layouts, house facades and materials that helped Barwood Homes gain consent in the first place. Affordable housing commitment likely to be reduced – Given its experience with other developers such as Banner Homes, the parish council is not confident that the 40% affordable housing offered by Barwood Homes would actually materialise.